More than 200 years ago Viapori’s archipelago fleet, which participated in the large sea battle at Ruotsinsalmi, sailed Suomenlinna’s waters. 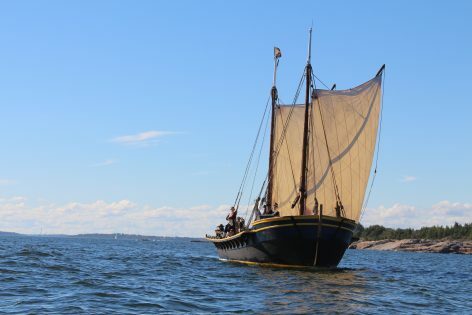 Next summer, you can step aboard cannon sloop Diana, which has been built according to its 1700s role models, and sail the coastal waters of Suomenlinna. During the Children’s maritime adventure, you are familiarised with cannon sloop Diana and the 18th Century. An action-packed and exciting boat trip to the Age of Enlightenment’s Suomenlinna with Admiral Chapman awaits. During the sailing, you will also learn the skills necessary on board the vessel of Suomenlinna’s archipelago fleet, such as rope coiling and knots, as well as signals. During Diana’s sailings you will see Suomenlinna from the sea and hear about the fascinating history of the archipelago fleet. The public can choose to assist in raising and lowering the sails, and a few brave ones can join in with the rowing. The journey is enlivened by Admiral Chapman and his crew. The duration of the sailing is approximately 1 hour 45 min. Sailings depart from Suomenlinna’s Tykistölahti Pier. You can reach Suomenlinna on JT-Line’s water bus or HSL’s ferry from the Market Square. The boat trip is not included in the ticket price. Diana is an open boat, so dressing according to weather conditions is important. Due to the wind, it may be cold at sea even on a warm day. It is good to have a warm and relaxed casual outfit, as well as flat shoes, with you. In case of rain, it is good to bring a raincoat. It is also worth taking a bottle of water with you. Children can participate only with an adult. We restrict our liabilities to organising the programme in accordance with the admiralty law. We reserve the right to make changes to the information provided. The fortification work began in 1748 on the Susiluodot islands off Helsinki, the location of present-day Suomenlinna. The dry dock in Suomenlinna is the oldest in Finland and one of the oldest operational dry docks in Europe.